Airedales do well on high quality foods. Some may have slightly dry “itchy” skin and can be supplemented with certain oils and kelp. Also many Airedales respond well to lamb and rice foods. They are often allergic to wheat, beef and chicken. One thing worth mentioning here is how long to feed puppy food. Some research indicates that feeding puppy food for too long can increase the incidence of hip dysplasia in dogs that are susceptible to it. The theory is that the higher percentage of protein found in puppy formulas can accelerate growth before the developing skeleton can support the weight. Some breeders start feeding adult food very early. Most people tend to gradually switch to adult food at 8-10 months. Again, this is something to discuss with the breeder and your veterinarian. 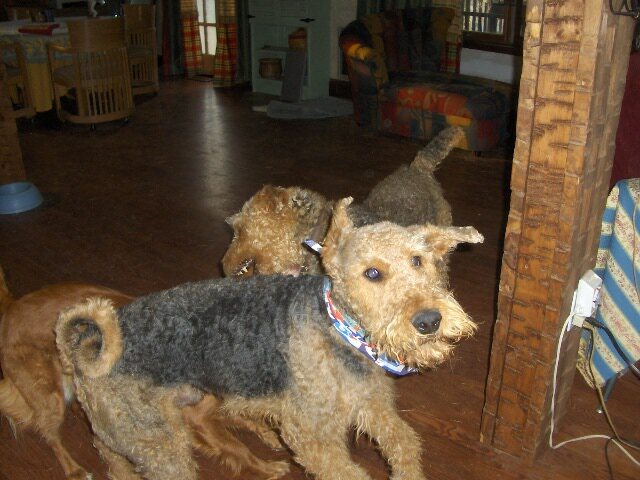 Many pet Airedales are clippered to the characteristic King of Terriers look. A good groomer should be able to provide this service. If not, contact a breeder in your area, many will be willing to provide grooming assistance on a limited basis. Airedales should be brushed with a pin brush on a daily basis to remove dead hair, since they do not “shed.” Slickering their furnishings (leg hair and face hair) will also remove dead hair, allowing new hair to grow in. Airedales do “blow” their coat if it is allowed to grow out. Dogs to be shown are stripped and trimmed. It is a very time consuming endeavor and somewhat difficult art to master. Airedales prefer to be with their families but also love to romp and play. A fenced area is great for exercise and play, while after play, they are ready to make great house dogs. Note: we only adopt to families who plan to keep the dog as an inside dog. Airedales are lovers of digging. They are definitely “terre-iers.” Always keep that in mind when preparing an exercise area. Crate training is a good idea for the young dog. As he gets older he may tend to use this as his “den” and has a secure area for traveling or your long days at work.